How does the most recent top-end electronic groupset from ‘The Big S’ stack up? Originally published on CycleEXIF.com in August 2017. Republished here with permission. Electronic gears are a luxury that few cyclists truly need, but it’s fair to say there aren’t many more desirable upgrades available. The “bzzzzzz” of a front shift and the “zip” of a rear shift on an electronic groupset is like a drug to the gadget-obsessed cyclist, and even the ears of the most Luddite cyclist prick up (I’m certain even with a slight pang of jealousy) at the sound. Excusing Mavic’s Mektronic, Shimano was the first to produce an electronic groupset that functions well and lasts the distance. Their top-tier Dura-Ace offering has been updated recently with the introduction of the R9150 Di2 group. 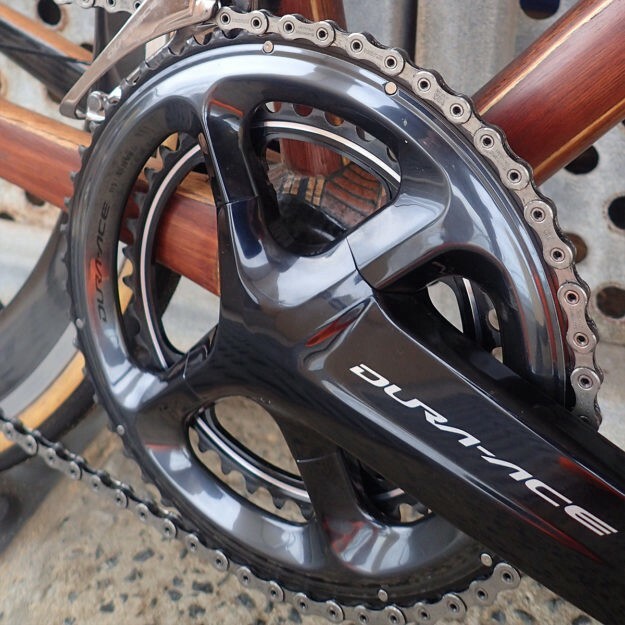 Shimano Australia were kind enough to send us a complete groupset to review. Visually, the new Di2 is completely different to the previous 9070 Di2. The new, bulkier chainset is even more asymmetric than before, now sporting a dramatically offset shape to the crank arm. 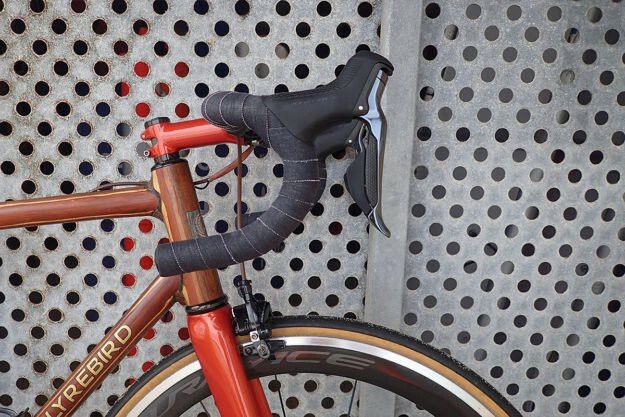 The front derailleur has shrunk in size and the shift & brake levers have had a subtle visual update, resulting in a more ergonomic design, now also sporting a different pattern on the rubber lever hood. The rear mech carries the most striking update, changing to an MTB-style ‘Shadow’ design — which does a wonderful job of tucking the rear mech inside the lines of the bike, rather than leaving it dangling out as a prime target in the event of an impact. The whole group is now black too. Having worked with Di2 across all of its previous guises numerous times over recent years, the initial install was a doddle — although it is worth noting that the positioning of the new style rear mech needs careful attention; being slightly less intuitive than other rear derailleurs on account of the mounting bolt not serving as the pivot point. For the most part, the setup is similar to the previous 9070 Di2. 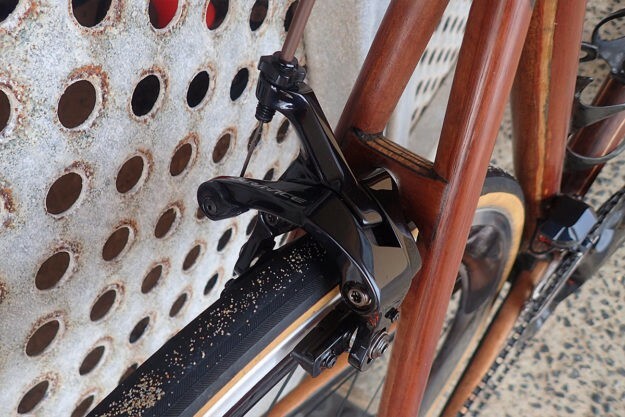 The instructions are worth following closely, though, as the front derailleur now uses an electronic adjustment rather than a limit screw for the alignment of the inner plate against the chain — presumably, a factor which has helped in reducing the size of the previously-bulky design. I found the new cable port on the front mech to be an interesting change as you now need to be much more careful in ensuring the wire into the mech is secure enough to stay clear of the rear tyre; and it no longer has the cable retaining clip of the 9070 and 6870 front mechs (the 7970 wire port remains my preferred solution in this respect). For someone upgrading to Di2 for the first time, plugging the system together wouldn’t be too much of a challenge (feeding the cables through the frame is probably the hardest part), but the fine tuning isn’t intuitive. You would get by with careful reading of the instructions — all of which are available online — but you might be better off getting an experienced LBS to do the work for you, and Shimano encourage this approach. Where the setup gets more detailed now is if you decide to use the new eTube app or PC program to fine-tune and customize the system. Initially, with Di2 it was only possible to adjust the functions of the system using an expensive control box, usually only available at your LBS — and even then you could only swap the shift direction of the buttons around. The newer 6870 and 9070 Di2 versions allowed for firmware updates via USB using the eTube PC program but still required the control box to do anything more. The new R9150 Di2 allows full customization of the setup; from changing the shifting to be like SRAM’s eTap to adjusting the automated Synchro Shift functionality. What might come as a surprise initially are default settings in the new system, such as the system not allowing you to shift into the two smallest cogs on the cassette whilst you’re in the inner ring. 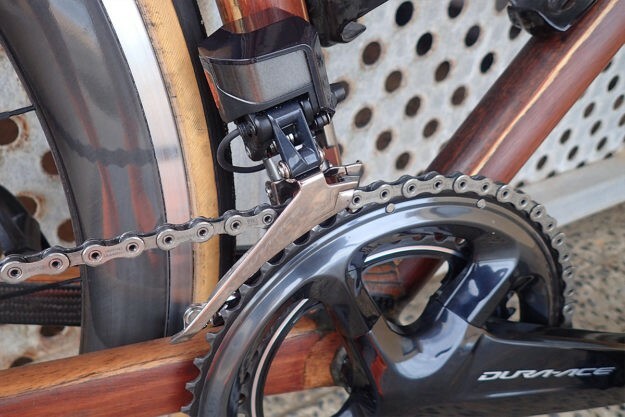 Whilst very occasionally frustrating, I can’t help but applaud functionality like this as it will reduce wear from unnecessary cross-chaining and will help the end user get the most from the system — not to mention from your chain and cassette. In a similar vein, the new Synchro Shift option is set by default to shift the front mech before you start using the biggest cassette sprocket from the outer ring. 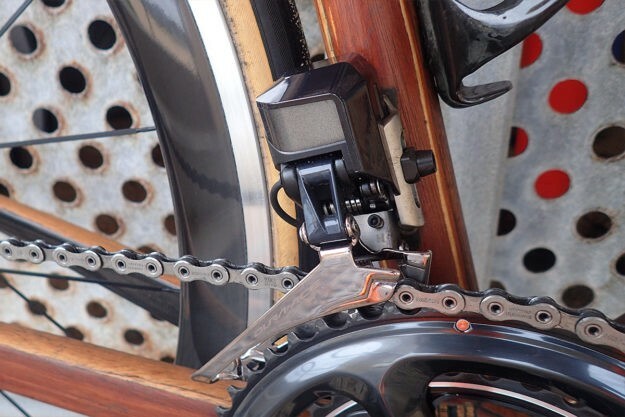 With Synchro Shift activated (by double-clicking the button on the ‘A’ junction box), as you shift up the cassette the system will automatically drop the chain onto the inner ring when you get to the second biggest sprocket. 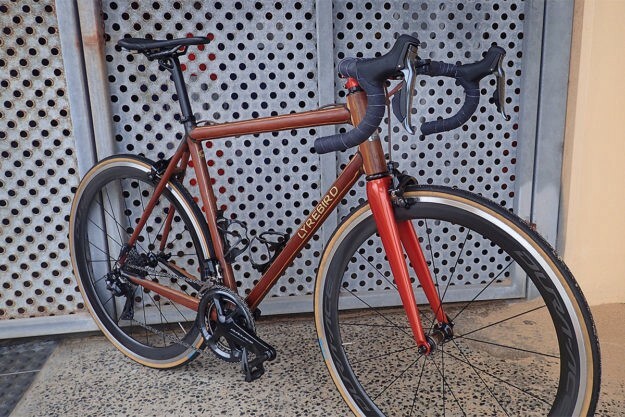 At this point, it also drops two sprockets on the cassette to match your cadence. 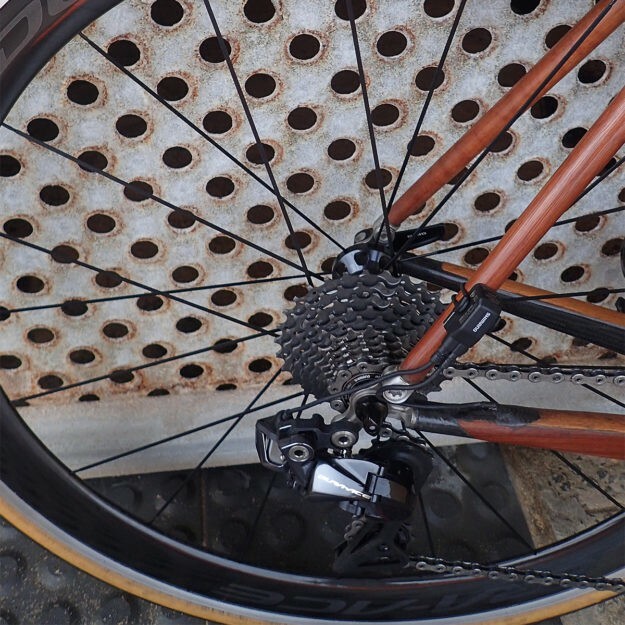 Going the other way, once you reach the third smallest sprocket, the system will use the next shift to lift the chain onto the big ring — and again, jumps two sprockets on the cassette to match your cadence at the same time. There is also a semi-Synchro mode whose response is based only on the shifting you are doing with the front mech. If you’re in the big ring and you shift to the inner ring, Di2 will drop two sprockets at the rear to match your cadence — and vice-versa, shifting from the inner ring to the big ring — much like you would do yourself with a manual shift or with an older Di2 system. 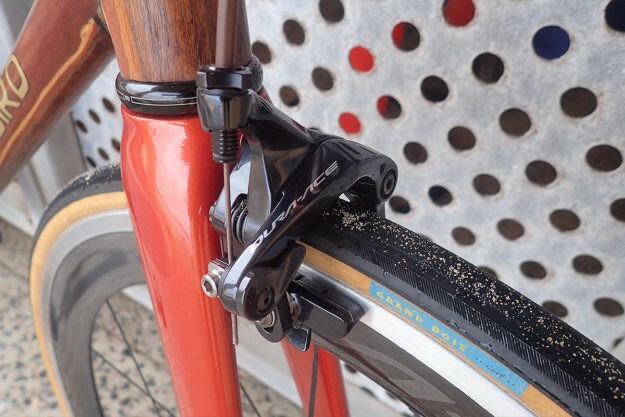 These synchro options are also fully customizable from the point on the cassette where the chain is shifted at the front to the number of automatic shifts for the semi-Synchro option. Use of the app requires the Bluetooth module to be included in your setup (visible on the build photographed here, but which can also be hidden away if you use the more discreet Bluetooth module or can better integrate this version). These Synchro options are now available on older systems too, as long as you update the firmware and internal battery. In order to rationalize on their offerings and to eliminate having to change rear mechs for those wanting to run a high-range cassette, the updated rear mech now only comes in one cage length. Whilst this is listed as being a ‘short cage’, by comparison to previous Shimano offerings it very definitely resembles a medium cage. Whilst this does allow for a 32t cassette to be used, it also changes the appearance of the rear mech on the bike. With this and the new ‘Shadow’ design, it now looks very much like an MTB rear mech. I find this visually jarring when the groupset is otherwise very appealing aesthetically — so much so that I even looked into whether it was possible to retro-fit a 9000 series short cage onto the new mech! 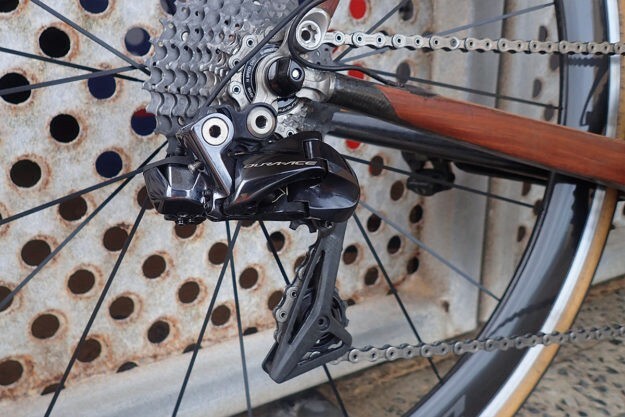 Longer cage aside, Shimano’s shadow derailleur design is a very neat solution. 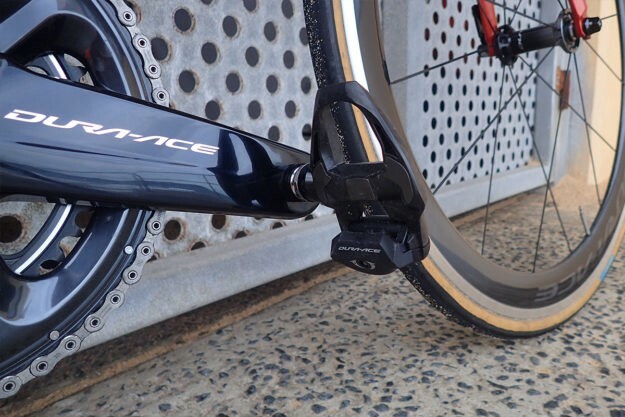 Looking back to see the mech sitting tightly inside the lines of the bike regardless of the gear being used is both satisfying and reassuring — perhaps even more so with Di2, given the expense of a replacement derailleur. As clever as the Synchro and semi-Synchro options are, I struggled to get in tune with them and found myself thinking too much about what the system was going to do for me or how I needed to shift so that the system would do its fancy automated thing. In the end, I realized I preferred to ride without these options activated so that I could remain in control of something I have always done as second-nature in my thirty-odd years of cycling. On the road, shifts are clean, crisp and fast and the system as a whole never skips a beat — it’s flawless, and there’s really nothing more to be said in that respect. If you’ve used Di2 before, nothing about the capability will be a surprise to you. Some of the newer features can be a love-hate relationship, though. 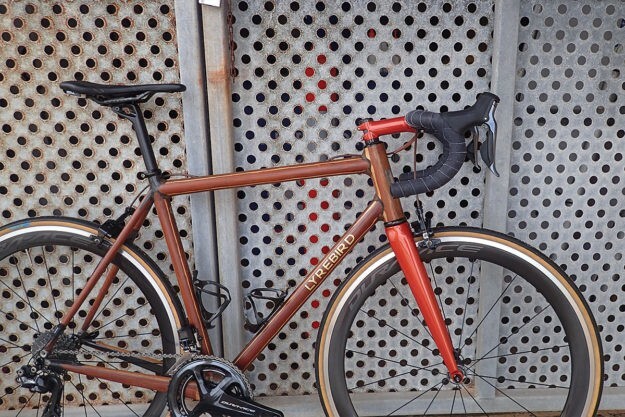 Having been on eTap for around nine months prior to receiving this Di2 kit and having reviewed it here previously, it is impossible not to compare. The obvious benefit of eTap is its simplicity — there are no wires, only two buttons (additional ‘blips’ excluded) and the functionality is very simple and straightforward. When Di2 is setup to shift in the same way (left lever for easier gears, a right lever for harder gears) it complicates this, albeit with potential benefits, depending on your personal preference. With Di2 you have the ability to separate front and rear shift buttons, the front shift can be one-handed (eTap requires both hands to be on the shifters), the Di2 shift is significantly quicker and Di2 obviously has the Synchro and semi-Synchro shift options. If you’re an eTap user you won’t necessarily miss any of these things, but if you are in the market for an electronic groupset they might be a deciding factor in choosing Di2 over eTap. I decided to reprogram the Di2 shift to work like eTap, with the two buttons on each Di2 lever split to control each derailleur — the smaller first buttons for the front derailleur and the second paddle-shaped buttons for the rear. Having set it up like this, I initially preferred almost everything else about Di2. The problem this introduced for me, because of not being able to program Di2 to shift the front in the same way eTap does, was having to think about which button I was pressing. Eventually, I had to revert back to the standard Di2 button setup so that I could separate the front and rear shifts rather than working on a principle of easier and harder. That said, I did use the hidden buttons on the top of the levers (which were originally intended to flick through computer screens) set to an eTap-style shift and really liked having that option. One thing I feel is missing from this new Di2 functionality despite all of the customization available is the option to program one button to shift front mech the other way from where it currently is. This would essentially be like pressing both shift levers on eTap to initiate a front shift, yet even better. The ability to disable buttons could then also be added so that knowing which button to press is never a second thought. There is so much to the Di2 customization that I didn’t even have time to fully understand and which, if I presented it all here, would make this a very lengthy and boring review. If you like the idea of these extra factors, features, controls, and customization then this will all be right up your street; and you’ll be merrily combining these features with those that can now be customized on your Garmin, Wahoo or whatever GPS device you might be using. In all honesty, it was all a bit much for me, though. On the buttons, one of the downfalls of previous Di2 iterations was the button feel — it was always considered too ‘soft’, especially versus the Campagnolo EPS button feel (one of which actually moves fairly significantly, more like a mechanical lever) and the very positive eTap click. These new levers do have a slightly more positive click to them, but it could still be better. With gloved fingers particularly, it is not always apparent that you have made a successful shift based on button feel alone. Whilst we’re talking buttons, now is probably a good time to comment on the levers. 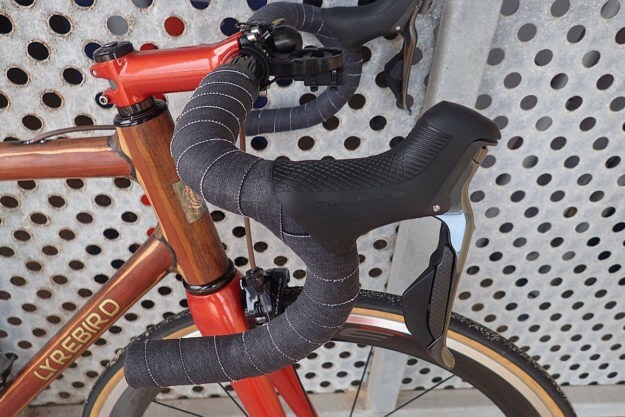 Although very comfortable, I have found that the Shimano lever shape and resulting hand position encourages a longer reach than other levers; and the lever seems lower despite being mounted at the same angle and position on the bars. It’s nothing dramatic but could be worth bearing in mind if you’re sensitive to changes in your reach and drop. There has been a lot of talk about eTap and its comparatively slow shift speed. Whilst it is never a problem in real world use, returning to Di2 made me realize how slow the eTap shift really is; and I found the shift speed on Di2 much more satisfying to use. The multi-shift function especially is significantly faster — especially when set to ‘fast’ or ‘very fast’ via the eTube app or PC program. Having all of this functionality in this day and age means an app is almost a no-brainer as a solution to manage the system. Unfortunately, it is quite apparent that the app is an adaptation of the eTube software and appears to have been built around an assumption that someone using the app will have used that software before. Consequently, it is a little over-complicated and it’s not always clear where to go to make a change, or what a particular function in the app will actually do. Additionally, the app is far from being an ‘always on’ connection. Whilst this is probably a good thing in terms of battery life, the requirement to connect and disconnect makes a change that should be quick and easy seem quite laborious; and if you make a mistake, misinterpret a function or want to revert to how you had it setup before, it seems nowhere near as easy to get back into the app as it should be. Ultimately I found I actually preferred connecting the bike to a PC with a USB lead and using the eTube PC program. A final note on Shimano’s eTube setup is the frustration of it still not being a Mac-compatible solution. Even as someone who rarely uses Di2 other than setting up review bikes or working on other people’s bikes, I have to have an old PC laptop squirreled away (or go through the effort of setting up a Windows emulation program on my Mac) purely for eTube use. This should not be necessary. 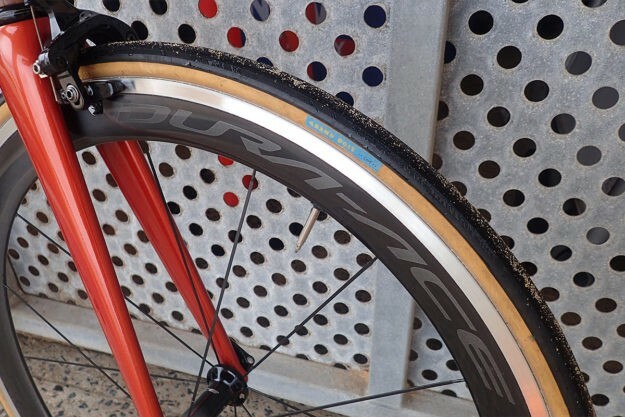 The pictured wheels are a pair of the new R9100 C60 clinchers. These are an aluminum rim with a bonded carbon fairing to create the depth. 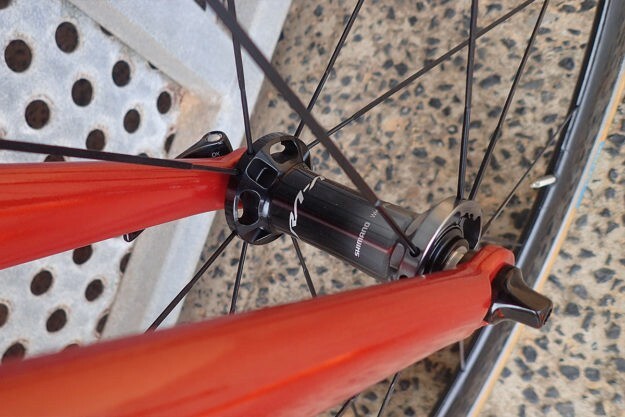 Despite what the new name suggests, these are essentially the same rim as the previous C50s with a new finish and graphics; although the tubular version is now updated to a wider rim with newer U-shaped profile and 60mm depth. The updated graphics look great, as does the new two-tone faded hub finish. 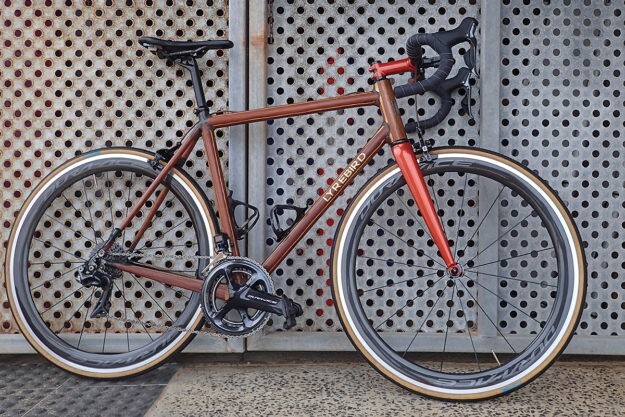 I’ll be honest in that I didn’t spend a lot of time on these wheels as I prefer to ride tubulars and less deep rims. In the time I did spend them I found they spin up nicely and appear to hold their speed very well — and they make a lovely noise when they’re wound up and cruising for that matter. Despite their depth and not being as U-shaped as others they’re not too bad in crosswinds, which was perhaps my biggest concern. They’re quiet, out of the box with no noise from settling spokes; and the braking was fantastic as should be expected of an aluminum rim. On the flip-side, they’re pretty heavy at a published weight of 1851g. Despite the good looks, the bonding of the fairing onto the rim doesn’t look tidy — although this is only visible up close. Finally, the freehub engagement felt slightly lazy compared to recently ridden alternatives from Mavic, DT Swiss & HED. The new R9100 pedals are no different in feel to 7900 & 9000 versions that I run on my other bikes. However, they are visually more refined and they do come in very slightly lighter. They also seem much more black in color and somehow feel even more classy for that. My 7900 pedals are on their last legs so I may well make use of the subtle updates and treat myself to a set of these. The brakes on the new groupset seem even more chunky than the previous 9000 iteration — whether this is real or imagined on account of the new black finish remains to be solved. Either way, they’re superb brakes and remain the industry standard and market leader in my opinion. My only issue with the R9100 brakes over the previous version is that the new quick release lever is hard to use. 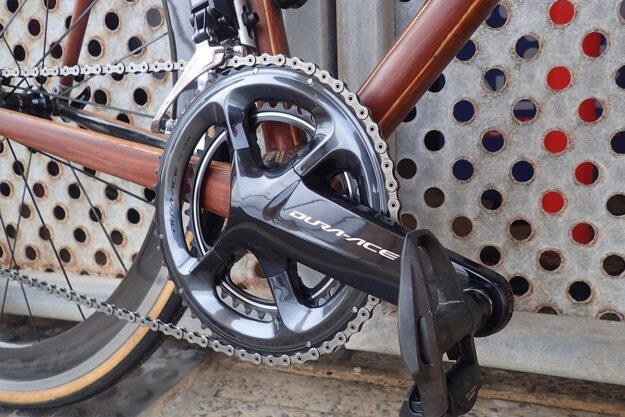 I have tried to present a balanced take on R9150 in this review, but the simple facts are that this new version of Dura-Ace is fully loaded and looks awesome — yes, even despite my reservations on the longer rear mech cage. Some of the features may not be for you, and that’s fine — simply ignore them. The benefits, comfort, and performance are all worth it; and if the extra benefits are for you then you can revel in all your automated synchro-shift glory, knowing that the rest of the components are entirely capable — and rarely bettered.